Kino Lorber has really been focusing their Blu-ray attention on early to mid-1990s films as of late, while the recent one-two punch of Mr. Destiny and Arthur Hiller's Taking Care of Business (1990) shows that they're willing to mix in a few less-remembered titles as well. 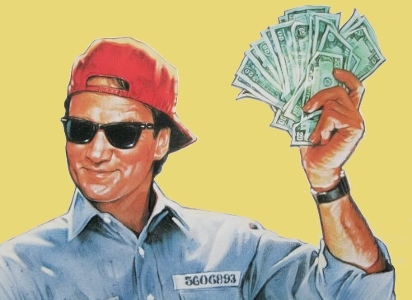 Both comedies were first released within two months of each other and star James Belushi...but aside from that, they're really nothing alike. Whereas Mr. Destiny is a good-natured, modern take on It's a Wonderful Life, Taking Care of Business trades off regret and redemption for a prison break and stolen identity. The escapee and thief is Jimmy Dworski (Belushi), due up for parole in just three days...but that's after the Chicago Cubs' last game in this year's World Series. 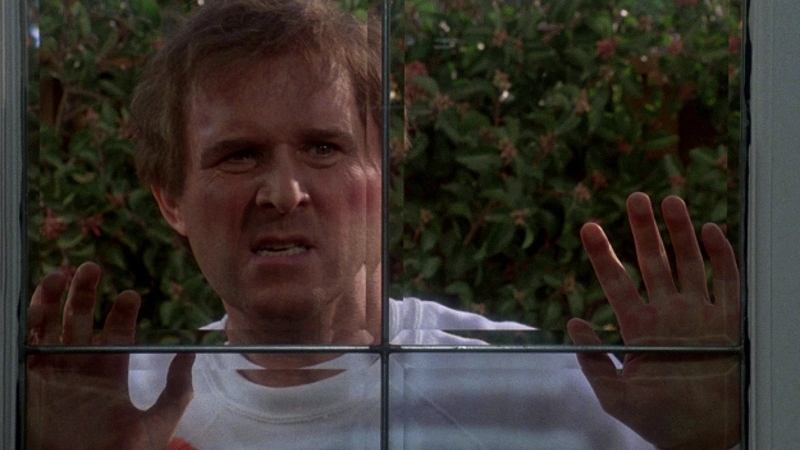 After winning two tickets from a local radio station, Jimmy comes up with a scheme to break out and, while fleeing police in a nearby airport terminal, comes across the loaded Filofax of advertising executive Spencer Barnes (Grodin). Jimmy decides to hold on to it for the $1,000 reward, but changes his mind when he finds credit cards, a house key, and other valuables tucked inside. Meanwhile, Spencer -- who's in town on a business trip, much to the dismay of his wife Elizabeth (Veronica Hamel) -- looks far and wide for his beloved Filofax, but has no identity, money, or clean clothes to his name. Poor guy just can't catch a break: the airline even lost his luggage. That's basically the setup for Taking Care of Business: Jimmy has nothing but good luck, even using the stolen identity to crash at a posh beach house owned by Spencer's boss (who's laid up in the hospital) while running up his credit card bill and filling in for Spencer at important business meetings. Meanwhile, the real Spencer is taxied around by obnoxious high school crush Debbie Lipton (Anne De Salvo), misses calls by his increasingly annoyed wife, and his reputation is all but ruined by Jimmy's antics. It's all played for laughs, of course, and Taking Care of Business really doesn't come across as mean-spirited as it probably sounds on paper...but either way, Hiller's film does a satisfactory job of building tension before both Spencers finally meet up with about 45 minutes of movie to spare. From there, our story takes kind of a surprising detour while softening around the edges, and a lot less punches are thrown than you'd expect. There are obvious problems with the story, but most obvious is how Taking Care of Business defies all kinds of logic to maintain Jimmy's all-too-easy identity theft. Are his neighbors blind and deaf? Has no one in these business meetings ever seen or met the real Spencer before? But if you're willing to suspend disbelief more than a few times along the way, there are enough laughs here and everybody involved seems to be having a good time. It's still more of a rental than worth buying, and I'll be honest in saying that Kino's slightly disappointing Blu-ray didn't quite tip me over the edge. It's got a new and exclusive audio commentary worth listening to, but the lackluster A/V presentation shows its age. Had this been a double-feature with Mr. Destiny, Taking Care of Business would be much easier to recommend. Since Mill Creek's 2002 DVD was a single-layered disc (with a pan-and-scan option, for true masochists), it's obvious that Kino's Blu-ray easily outshines it even without trying very hard. Still, this 1080p transfer is lackluster in comparison to typical catalog releases from the era: though framed at its original 1.85:1 aspect ratio, the color palette is fairly bland with a thin haze that obscures what should be a stronger level of image detail. Black levels are rarely consistent and often lean towards dark grey, which makes most indoor scenes look particularly flat. It goes without saying that Taking Care of Business was never visually stunning in the first place (in other words, it'll always look like a product of its time)...but there's clear room for improvement here, whether or not you believe it's worth the extra spit and polish. NOTE: The images featured on this page do not necessarily represent the title under review. The DTS-HD 2.0 (Stereo) Master Audio mix, even without the heft and presence of a full-blown 5.1 track, is a bit closer to "satisfactory" than the video. Dialogue and effects are clear and balanced, while Stewart Copeland's score also makes its presence known without overpowering. Channel separation is noticeable at times, but it's mostly a centered presentation that feels perfectly natural for the genre. Frustratingly (and much like Mr. Destiny's Blu-ray), optional English subtitles have not been included during the film, even at Kino's slightly higher-than-normal price point. What gives? The static menu interface includes options for playback, chapter selection (eight total), subtitle setup, and bonus features, with quick loading time and few pre-menu distractions. As with most recent Kino catalog releases, this one-disc package arrives in a standard keepcase with poster-themed cover artwork and no inserts of any kind. Disney's 2002 DVD was a movie-only disc, so at least Kino has stepped up with two new-to-disc extras. An exclusive Audio Commentary features co-screenwriter Jill Mazursky with moderation by Douglas Hosdale, and it's a pretty solid track that's much more interesting than the one on Mr. Destiny. Topics of discussion include her inspiration for the story, working with co-writer Jeffrey "J.J." Abrams early in their careers (Taking Care of Business is actually his first writing credit, if you can believe it), taking a crash course in script writing, supporting characters, changes from the first draft, improvisation, the Chicago Cubs, other projects, and much more. Also here is the film's Theatrical Trailer (2 minutes), which looks to be in fairly decent shape. Unless you hate commentaries, what's here should appeal to fans of the film. 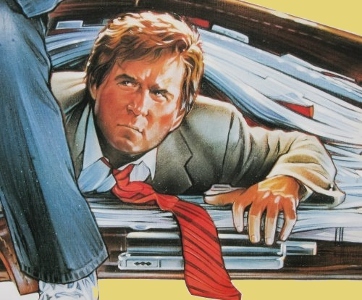 OK, so Taking Care of Business isn't exactly the most original movie: the core of its plot holds the same "switching lives" story that we've seen before, while the mere presence of Charles Grodin will immediately remind viewers of the superior Midnight Run. 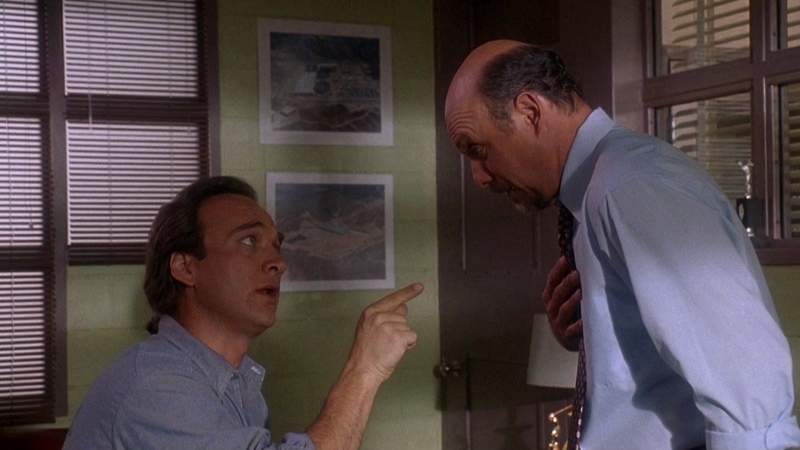 But there's still some enjoyment to be had: James Belushi plays his part well enough, and I appreciate that both leads don't even share a scene until well past the hour mark. Still, Taking Care of Business has more than a few ridiculous inconveniences, and it can't help but trail behind the more enjoyable Mr. Destiny overall. Kino's Blu-ray is a mixed bag as well: the A/V presentation is OK but could use some improvement, while the meager bonus features are still better than older barebones DVDs. Rent It, although die-hard fans should consider a purchase.